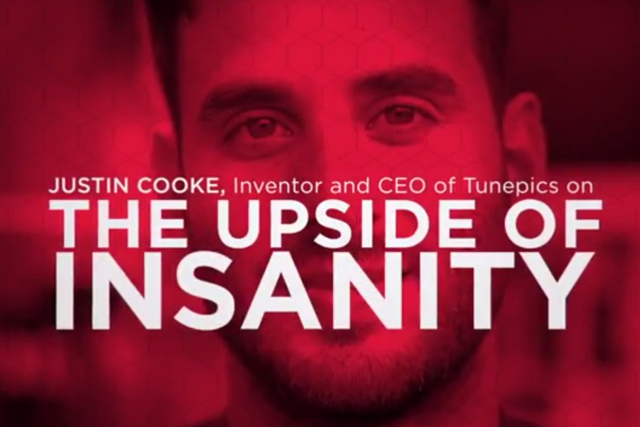 "There's magic in insanity," claims Tunepics founder and former Topshop CMO Justin Cooke, in a video for Virgin Atlantic in which he also discusses the challenges of running a business. The entrepreneur reckons that the hardest aspect to starting a business is that "you have to do everything", referring to his experience in conceiving and setting up music-based social network Tunepics. Cooke’s comments come from a two-minute interview, part of a Virgin Atlantic series called ‘Brilliant Minds’, which is based on Fast Company’s "Most Creative People in Business 1000" list. "The word insanity for some people might be an offence, but for me it’s quite beautiful," Cooke says in the film. "There’s magic in insanity. It makes me think of people like Einstein, people that do things that you didn’t know were possible until they did them." Asked by a disembodied female robot voice what the best advice is that he has ever received, Cooke says: "Just do what you love. It’s always led me to the right place." "The greatest value that you can add as a leader or as a chairman or a CEO is by not running the company. If you are stuck in running a company, it’s very difficult to know what the next thing is or how you are going to evolve. "It’s a challenge I’ve been finding myself – I’m obsessed with the product and how people are using the platform. In the meantime, I should be thinking about what the next level of discovering music looks like." Cooke is adamant that a strong business idea should be informed and driven by passion. "Tunepics is something that’s very close to my heart," he explains. "It’s really just about connecting people through music – how people can discover new music and share it in a new way. "When people are searching for virality, or something that everyone’s talking about, people will always carry the message for wonderful things. Music is about deep, beautiful experiences, about love, about being burned, about being hated, about being discovered. You talk about things that you love – it’s just a natural."